Recently I deployed Bitwarden (https://bitwarden.com/) in Synology Docker and thought I would share my experience for others looking to do so. I've used a number of password managers (lastpass, keeper, keepass, etc) and still use some for professional reasons. For personal use I was using KeepassX so I could control the safe (in Dropbox) and did not want my personal data cloud hosted. I need it to run on linux, windows, osx as well as mobile (android) support. I also am a strong proponent of two factor authentication, keepass offers it but is a lackluster implementation. I wanted a more robust self hosted password manager that I could host on my synology. 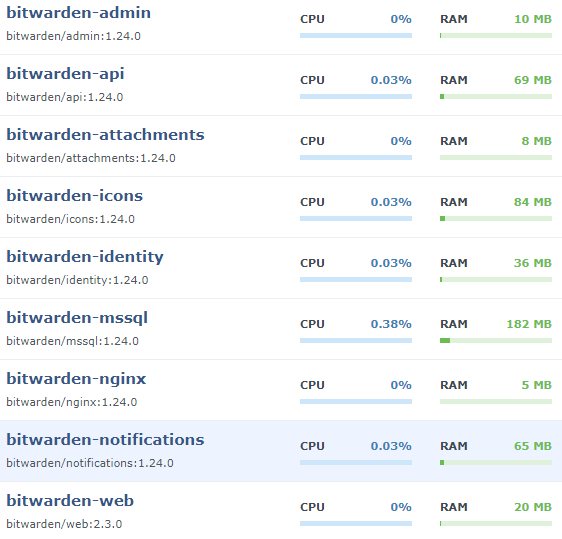 Go to "Control Panel" -> "Security" -> "Certificate" -> "Add"
"Add a new certificate" -> "Next"
Description "Bitwarden Certificate", "Get a certificate by Lets Encrypt" -> "Next"
Domain name: "bitwarden.domain.com", Email: "<your email address>" -> "Apply"
Go to "Control Panel" -> "Application Portal" -> "Reverse Proxy" -> "Create"
Description: "Bitwarden https reverse proxy"
Source: Protocol: "HTTPS", Hostname: "bitwarden.domain.com", Port: "443", HSTS and HTTP/2 "Unchecked"
Destination: Protocol: "HTTP", Hostname: "localhost", Port: "8123"
Go to "Control Panel" -> "Security" -> "Certificate" -> "Configure"
Services: "bitwarden.domain.com" Certificate: "bitwarden.domain.com" -> "OK"
Building docker environment override files. Building FIDO U2F app id. Hopefully this guide is helpful to anyone looking to host bitwarden on their synology/xpenology device. Thanks for mentioning the corrections. It seems I'm no longer able to edit the original post. Referencing the Bitwarden docs for all the latest changes is highly recommended as it does change frequently. Hopefully Synology can get Docker updated to a point where we no longer need to manually create the folders that were missing as well. Save the file and test the configuration. The following should return "Syntax is OK" and "Test is successful"
Now bwitwarden.url/admin should redirect you to the appropriate page where you can login with an admin account. In my current installation I can reach the admin site using https://bitwarden.domain.com/admin/login/ without a dedicated port. There is an issue open regarding the https://bitwarden.domain.com/admin redirecting to a non https port here https://github.com/bitwarden/core/issues/253. Your approach could be interesting alternative as a dedicated url specific to admin that is internal only and not public facing. Also I have edit capability to the orginal post and will attempt to keep it relevant and recent. I followed the instructions, but am having a problem. I can't login to bitwarden from the android app when connected to LTE. I can only login to the android app when connected to my LAN/WiFi. I can login to the Bitwarden webUI/vault from a web browser on my PC and android phone (on WiFi and LTE), I can login with a browser extension from a PC on the same LAN. Any ideas? I assume it is something with the certificates? I don't think it is port forwarding as I port forwarded port 443 and even tried to DMZ briefly to see if the firewall was the problem. Fixed it... IPV6 firewall was not port-forwarded, while the IPV4 firewall was. T-mobile LTE is IPV6 only and would only try to connect through IPV6. After following these instructions to the letter, I'm trying to go to https://bw.domain.com and it's acting like the site doesn't exist, but if I go to http://bw.domain.com I'm able to reach the site, of course without the SSL certificate. Any ideas as to what my issue is? Happy to provide any add'l information needed. Edit: I also just realized that when I go to create my account, I click on "Submit" but nothing happens. Maybe this is related in some way? Edit2: Nevermind, y'all. Went to incognito and it worked, so probably just clear cache and I'll be good. I'm leaving my stupidity up for the world to see, just in case it helps anybody else in the future. I've got no idea how to get bitwarden to ask these questions and I do not know what to include in the ./bwdata/config.yml to manually add the proxy. Can anyone help me out here? I've not attempted an install since my original post. Please let me know if this is helpful with regard to your setup. This seems to be helpful. I can now start BItwarden and connect to it from my home network. Tomorrow i'll try to get it to work outside the network. you can also try `docker logs bitwarden-mssql` to see the logs and what is causing the restart. Just upgraded the memory. It was quite easy, and gave me the chance to remove a lot of dust from the DIsk Station. Now Bitwarden works perfectly. Thanks all for helping. but i dont know why bind already exists. There is just the DSM it self. Did you choose the option to use the default ports when setting up Bitwarden? Like Binkem posted before, i did not got asked for the ports. Are you also using a unique domain name for your bitwarden instance and proxying it to bitwarden? I forgot to ./bitwarden rebuild after changing the config. Now all containers are up and running!